My beloved gorgeous friend Chiara sent me a bundt pan … and not just a garden variety bundt pan but a stunning, almost architectural pan. It is soooo pretty – and I was really excited to be able to use it! I kept wanting to bake a bundt cake when I was at my sister’s place, but never seemed to find the time. While cakes from scratch are generally easy, they also take a certain amount of commitment. You need to set aside some time to really think about your ingredients, and gather them. You usually use about three or four mixing bowls to assemble things separately and then mix them all together. You bake, wait, remove from pan, wait again, and then ice. You can make cakes in less than an hour, but the slightly more complex ones take a while. Granted, a lot of the time is spent waiting for things to bake or cool down, but still, you need to set those times aside. I wasnt organised enough at my sister’s house to do that. I served this bright tart glowing lemony cake with sweetened vanilla whipped cream and balsamic strawberries. Each on their own is fabulous. (Admit it, sometimes a mouthful of whipped cream is just what the doctor ordered!) But together… oh such ambrosia. Such contrast in colour and texture, such balance of flavours. They enhanced one another. So yummy and so good. The thing I love about this cake is that it is cake. Deceptively simple, its lemon flavour shouts with joy. Its fluffy and yet slightly damp – a pretty good combination if you ask me. 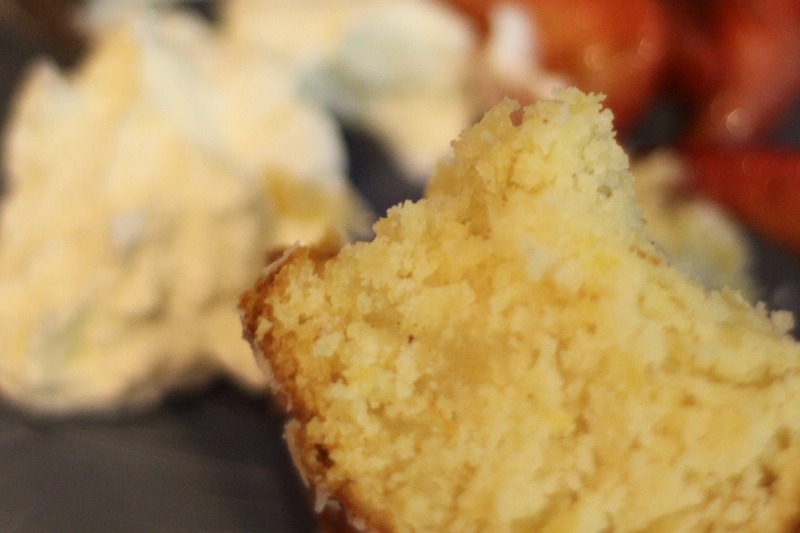 Leftover cake becomes a little more solid, like pound cake … nothing to frown at either. You can bake it in 2 9-inch cake tins as well – if you did it this way, I would ice with whipped cream and have a layer of strawberries and whipped cream in the centre. Either way, this is a great dessert which people really flock to – its less rich and decadent than chocolate cake, its a bright and fitting end to a big dinner, and its totally delightful. Oh and please… dont forgo the lemon glaze. Its fantastically tart, adds a layer of sweetness, and a textural crunch to the crust of the cake. It doubles the lemony flavour and is an integral part of success of the cake. Preheat oven to 190C (350F). 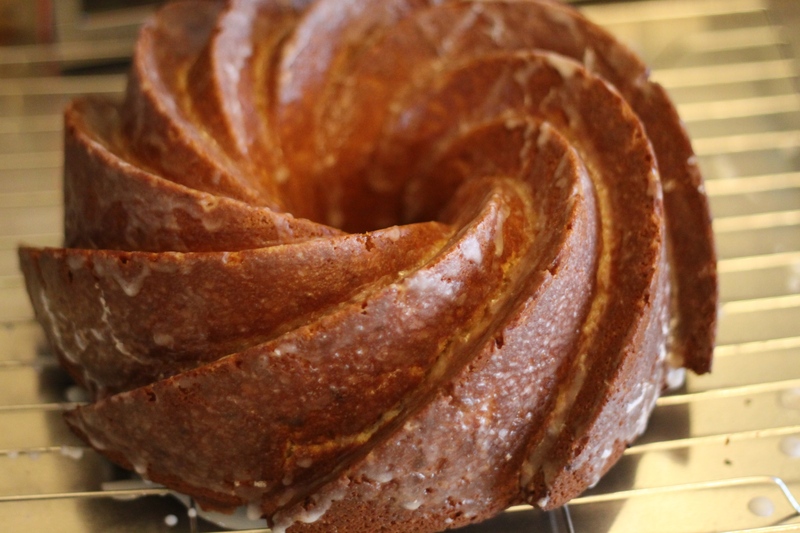 If your bundt pan is non-stick, butter it well with soft butter, making sure to get into the grooves and gulleys well. If its not non-stick, melt about a tablespoon of butter, stir in about a teaspoon of flour, and brush all over pan. This should ensure that your cake comes out whole. If you are baking in cake tins, butter and then line the tins with parchment or baking paper. Wash the lemons well (I hope you are using organic lemons – they make such a huge difference in flavour!). Grate the lemon peel into a small non reactive bowl, making sure not to grate any (or much) of the pith. Slice the lemons in half, and juice the lemons straight onto the lemon peel. You should have 5 – 7 tablespoons of lemon juice and peel. Set aside for at least ten minutes or so – the acid in the lemon juice will soften the peel so that when it gets added to the cake mixture, it will melt straight into it. In a small bowl (I actually used a large 4-cup measure – less washing up), whisk together the flour, baking powder, baking soda and salt. Set aside. Whisk together the eggs and egg yolk until lightly lemon colored, and set aside. Whisk the vanilla extract (a whole vanilla bean would work wonders here as well but would be rather decadent!) and the buttermilk into the lemon juice and rind. Set aside. Cream together the butter and sugars until light and fluffy. Really allow your mixer to do some work here – you want a creamy mass where the sugars have really been incorporated into the butter. Dont overbeat, but dont just mix it all together quickly either. The basis of a good cake is a solid creamed sugar and butter mixture. Add the eggs and whisk again until a batter forms. Add the flour mixture and lemon-buttermilk mixture alternately until all is incorporated and you have a thick batter. Spoon into your bundt pan (or divide evenly between your cake pans), and bake for 45 – 55 minutes, or a cake tester is inserted and comes out clean. Let the cake cool in the pan for about 15 minutes. While the cake is cooling, juice the remaining lemons, and whisk together the lemon juice, 1 tbsp buttermilk and powdered sugar. This will be your glaze. Set aside, covered, until you need to use it. Then, rap the bundt pan sharply against a flat (strong) surface a couple of times. This should loosen the cake out. 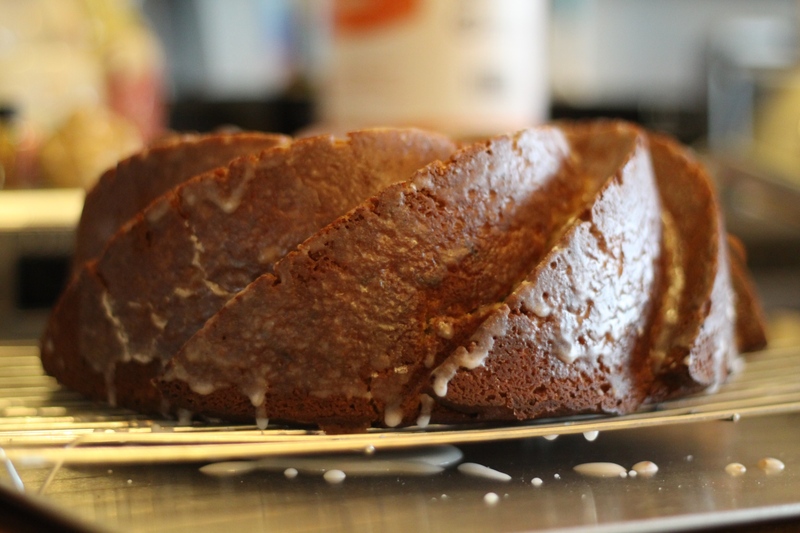 Flip the cake onto a cake rack, and lift off the bundt pan in one smooooth move. Place the cake and cake rack over a jelly roll pan (to catch any dripping glaze) and slowly pour over about half the glaze. This will soak into the still warm cake. Leave to settle for about an hour, and then pour over the remaining glaze and transfer to a serving plate. Serve with about 2 cups heavy cream, whipped with 1 tbsp sugar and 2 tbsp vanilla extract, and a punnet or box of strawberries, hulled and chopped and mixed with a tablespoon of aged balsamic vinegar. I swirl of lemon heaven!!! Actually much more than even that! Love! !